UPDATE: The Wayans Brothers are bigger box office stars than Ryan Gosling and Sean Penn. That's this weekend's headline as the minuscule-budgeted A Haunted House raked nearly $19M to take second behind the performed-as-expected Zero Dark Thirty. Gangster Squad started with a decent bang but dropped -8% Friday to Saturday, which doesn't bode well for any long-term prospects for the Warner Bros. product. Next weekend it's Mark Wahlberg versus a couple of freakish kids and I may just take the latter in an upset. It's taken long enough. 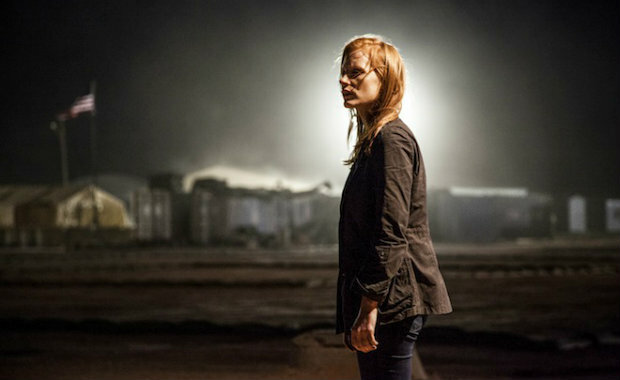 The wait wasn't quite as long as the hunt itself but after a small rollout in mid-December to secure its Oscar eligibility, Zero Dark Thirty finally goes wide this weekend. And while its director, Kathryn Bigelow, was royally jobbed by the utterly inept Academy, it did - rightfully - secure a Best Picture nomination along with four other nods. The ripped-from-the-headlines thriller has performed overwhelmingly well in limited release but does the average moviegoer want in on the mission? Zero Dark Thirty $25M - The buzz over Bigelow's ridiculous Oscar omission has likely increased awareness for its opening weekend. The endless stream of articles debating the film's politics has aided as well. My review is here. Gangster Squad $20M - The packed-with-superstars period piece will score well with audiences as it's roughly 90% more entertaining than your typical January release. Even if it's not really a January release. Django Unchained $13M - Quentin Tarantino was slighted but his jacked up western picked up a Best Picture nomination to keep the cash flowing – $114M and counting. A Haunted House $12M - A Wayans Brothers comedy. 'Nuff said. Les Misérables $11.5M - Like Zero Dark Thirty and Django Unchained, its director was neglected by the Oscars but bagged a Best Picture nod. Staying strong with the female demo – shocking, I know.